Cassava Republic Press, 9781911115595, 340pp. "We put together this collection of twenty-five narratives to correct the invisibility, the confusion, the caricaturising and the writing out of queer women from history." 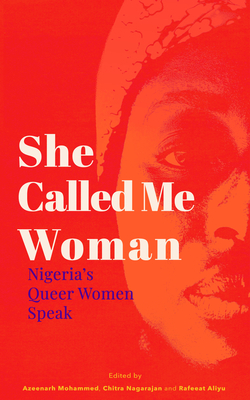 This stirring and intimate collection brings together 25 captivating narratives to paint a vivid portrait of what it means to be a queer Nigerian woman. Covering an array of experiences - the joy and excitement of first love, the agony of lost love and betrayal, the sometimes-fraught relationship between sexuality and spirituality, addiction and suicide, childhood games and laughter - She Called Me Woman sheds light on how Nigerian queer women, despite their differences, attempt to build a life together in a climate of fear. Through first-hand accounts, She Called Me Woman challenges us to rethink what it means to be a Nigerian 'woman', negotiating relationships, money, sexuality and freedom, identifying outside the gender binary, and the difficulties of achieving hopes and dreams under the constraints of societal expectations and legal terrorism. These beautifully told stories of resistance and resilience reveal the realities of a community that refuses to be invisible any longer.